Due to some temporary technical issues with our normal shopping cart software, please use this form to place your order. Sorry for the inconvenience. Once PayPal confirms to us payment is OK, we’ll do our very best to process your order as soon as possible. Please allow 24-48h for access to training. All other products will be delivered after purchase. Check you enter the correct email address ;) and make sure to check all your email folders if you do not see our email in your Inbox. Make sure to enter your best email and to enter it correctly or we cannot send you your purchases. Access to the training members area will be provided within 24-48h. We will create your account and email you the logins. 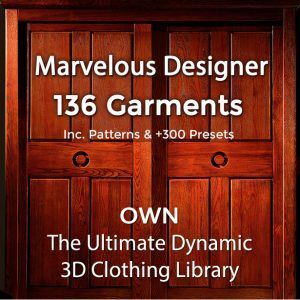 This is our Ultimate MD Garment Library which includes 136 ready-made garment files, the clothing templates and over 300 MD Physical Property Presets. 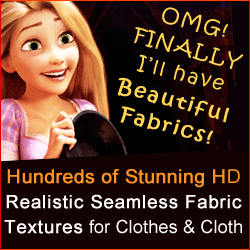 This is the grand library with hundreds of gorgeous seamless fabric textures and fancy trims. Additional intricate lace and fancy trims to what you get in the Seamless Fabric Textures Library.